As a Portland landscape designer I use Coreopsis verticillata and its’ cultivars because it’s a perfect colorful, low maintenance plant for modern landscape designs, bee friendly gardens, cottage gardens, container gardens and low-water plantings. Clients love it because it flowers for such a long time from summer into fall. Coreopsis is beloved. I wrote this blog to help clients understand which Coreopsis will live for years and which ones will not. Coreopsis verticillata is one of about five species of Coreopsis that are native to the United States. 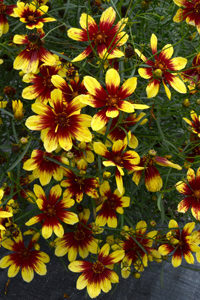 Many people feel that Coreopsis verticillata will grow too wide after about five years and will need to be divided. A lot of my younger clients are so focused on low-maintenance plants that I typically don’t include any plants that need to be divided in their plans. I still have this old-fashioned idea that I can provide a planting plan where all the plants will last 20 years and the trees forever. However, if I really stick to that I’m shorting my busy young clients of some plants that are going to do very well for a long enough period of time. Digging up a plant every five years chopping it in half, tossing half of it or giving it away, and then re-planting half of it is less work than having to buy a new plant. 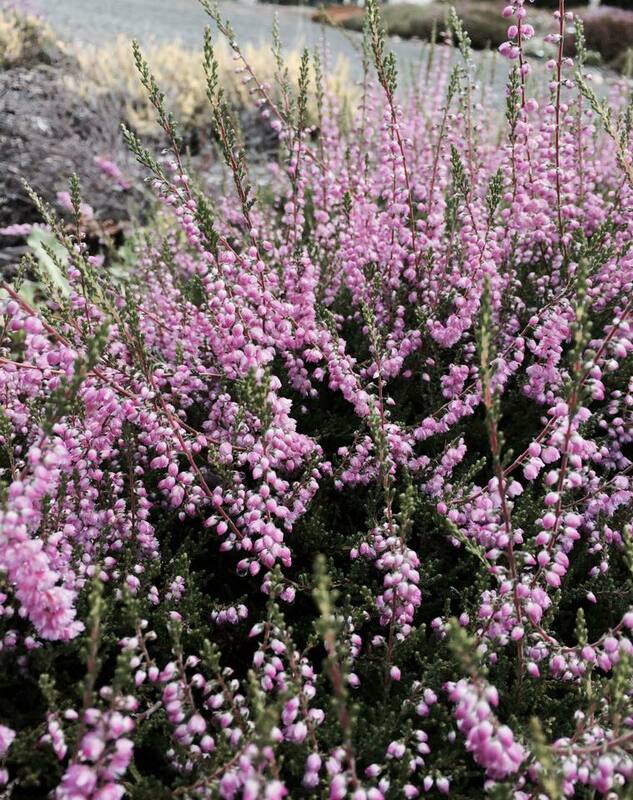 Summer flowering heather can be easy care. I used heather at my vacation house because it’s so easy. I’m only there once a month, have no irrigation and I have hungry deer. It’s got to be a tough plant to make it! I’m sorry to say that with heather you need to know what you are doing. 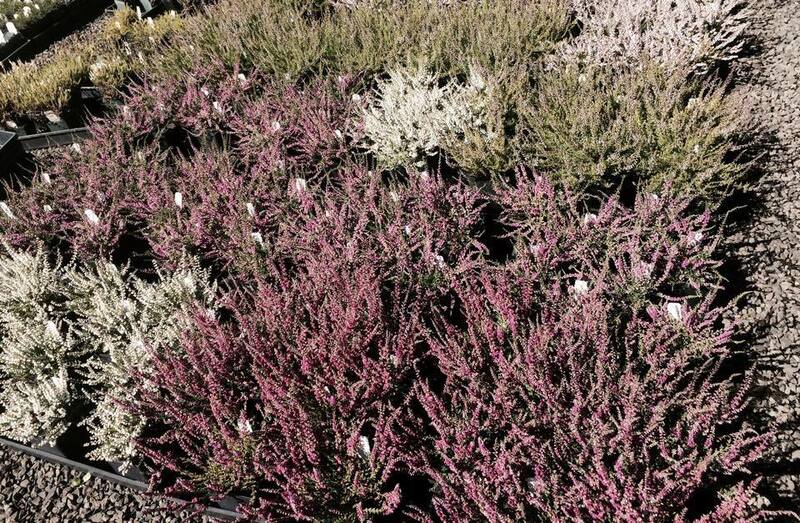 Lots of people buy heather, plant them and they die quickly. Once you have proper information these plants are low maintenance. Without knowledge specific to heathers success is tenuous, with a little knowledge this is a very tough drought tolerant winner of a plant in my book. 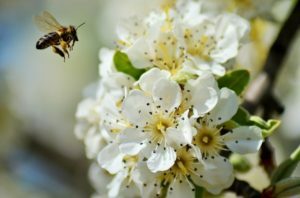 It has year-round beauty, is great food for bees and it can be the evergreen plant that holds a summer garden together visually through the winter. 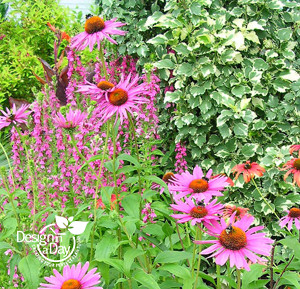 Heathers need good drainage but if you have clay soil don’t despair. Heathers planted on a slightly burmed planting bed or low mound do well. Heathers are perfect for slopes. Watering well the first year is critical. 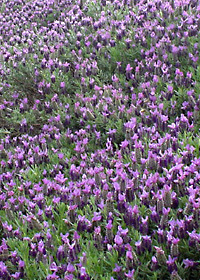 If heather plants dry out to the point of wilting, even just a little bit, they will die. There is no rescuing it with water and having it “perk up” as many other plants will do. When the tiny fine foliage wilts or dries the plant stops taking in water with its roots. The best time to plant is fall. A designer pal plants her heathers in pure barkdust. I’ve done this and had excellent results as long as it was on a slope. Don’t try this on a flat landscape. Pruning is important and easy. The most important year for pruning is the second spring after you have planted the plant. Prune before new growth starts. You must trim to just above the previous years wood; trim too much and you will have ugly holes in your plants that may never fill in. Avoid pruning late in fall or winter. 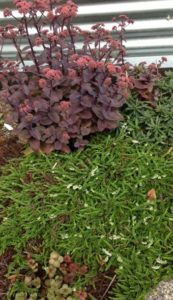 Trim too little or not at all and you will have an okay plant for a few years and then it will be ugly with dead wood in the center of the plant. When this happens we can’t simply cut it back severely which we can do with many plants to fix the problem. 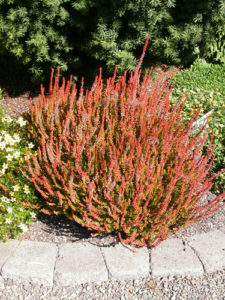 Trimming every year before new growth starts (February or March for Pacific Northwest) will keep your plants attractive long term. 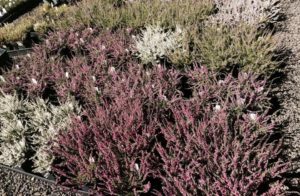 Calluna Vulgaris ‘White Lawn’. 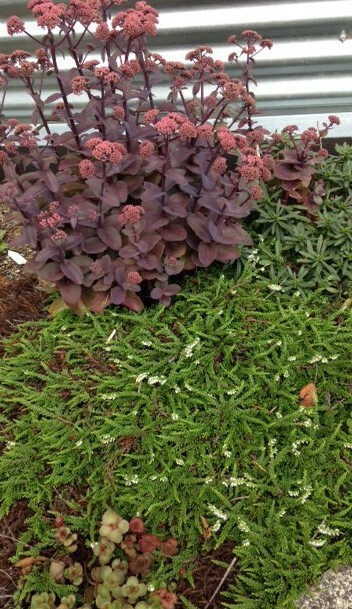 Sedum ‘Xenox’ and Sedum ‘Voo Doo’ planted with the heather. Summer heather/Calluna Vulgaris is a great plant for hot sun situations. This summer for the first time ever, I actually had foliage burn. They got no water for 45 days in record breaking heat, but since these plants have been there for five years, they are now coming back beautifully.